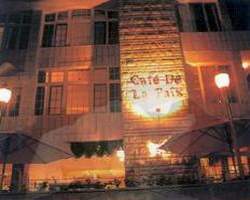 The carlton Hotel is a three star luxurious hotel located in the center of the business and diplomatic area in Amman. Carlton Hotel location is approximately 45 minutes from Amman International Airport and 5 minutes from touristic sites of Amman. 45 minutes from Queen Alia Int-Airport (by car). 5 minutes from Downtown and touristic sites of Amman. 10 Blocks stroll from busy downtown shopping arcades. 2 Minutes from financial and business districts. The Carlton hotel consist of 59 rooms of which 22 are single, 26 double and 10 junior suites. The rooms are equipped with remote T.V and 11 Satellite channels, remote controlled heating and cooling system and direct-dial telephones and 24 hour room service. Extra services such as hair dryers, baby sitting and secretarial services are available upon request. The Carlton hotel combines a level of personal service & atmosphere that are unique to Middle East style hotels. The meeting room is located at the lower level of the hotel. Seats 70. Audio visual equipment, Fax, Printer, overhead projector and flip chart are available upon request. Pharmacy, Optician, Florist, Photo shop, post office, Airline office, bank and limousine service, are with walking distance from the hotel. The Visa Corner Restaurant at the lobby level is open daily from 6:00 until 22h30; seats 120, offers international cuisine and buffets. The Embassy Cafe located in the lobby, when you want to enjoy a cup of coffee with any of our assorted pastries. For room service a special menu is available daily 24 hours. The summer restaurant for casual dining, relaxing weather & enjoing the pleasant weather of jordan, offers a selection of local and international menu.